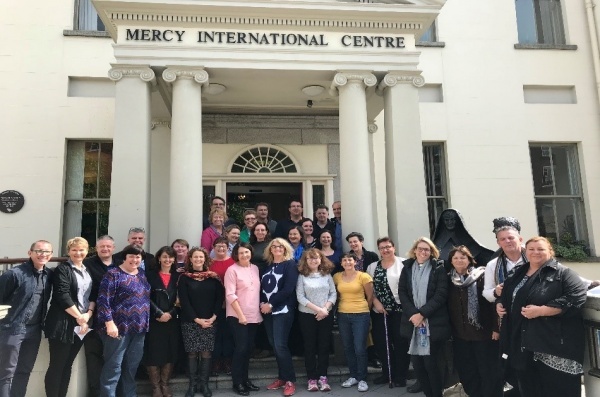 At 2.30pm, Thursday, 10 May 2018, 33 Pilgrims from a diverse range of Mercy Ministry’s across Brisbane, Central Queensland, North Queensland, Parramatta and North Sydney gathered together at 64 A Lower Baggot Street, Dublin, to begin a 9 day journey together. Crossing the threshold and through the red doors of the Mercy International Centre we paused to reflect on the many doors we passed through to arrive at our destination, of the journey we had each undertaken and the blessings and gratitude for those who had made it possible. As part of the opening session Sr Cath Reuter spoke to doors as being a sign and symbol of hope for Pilgrims, a space to stand and pause in or to be passageways toward the known and remembered or into unfolding destinations and relationships. As we began, each Pilgrim was invited to choose a small handcrafted ‘door of hope’ icon. We prayed this ‘door of hope’ would in the days ahead be a symbol to remind, invite and allow the Pilgrims to make connections and find hope and meaning in their lives. The first days were then spent companioning with Sr Mary Reynolds, Sr Mary Trainor, Sr Aine Barrins, Sr Sheila Lunney and Sr Anna Nicholls, as we met Catherine McAuley. We stepped back in time to learn of the religious and political milieu of 19th Century Ireland, a vivid picture painted of the economic and social context in which Catherine lived. Through Catherine’s letters we glimpsed some of the struggles, sadness and challenges but also the humour, joys and successes. We paused on the concrete steps inside the House where Catherine and the Sisters working with her and those who followed, collapsed, exhausted from their work. We walked the streets of Dublin treading where Catherine once trod, visiting places where she had lived, we were welcomed with warm hospitality by the Coolock community of Sisters as we visited Coolock House where Catherine lived with the O’Callaghan’s and where her experiences shaped and influenced her future work. At George’s Hill we reflected on the struggle it must have been for Catherine to complete her Novitiate away from Baggot Street, we celebrated her profession and the genesis of a new Congregation. With humility and gratitude we witnessed Sr Cath, Sr Aine and Sr Anna reaffirm their commitment as Sisters of Mercy and as partners in Ministry we together renewed our commitment to serving others in the spirit of Mercy. As day 5 dawned the program took a more contemporary approach. Sr Breege O’Neill reflecting on the leadership style of Catherine, spoke of the learning and wisdom of leadership. Sr Breege challenged us to consider the qualities of leadership, and as an exercise take the time to think about how someone would describe us. What would people say about us in our leadership? Sr Denise Boyle fmdm, spoke to us in the words of Pope Francis and Laudato si’ imploring us to ‘hear both the cry of the earth and the cry of the poor’, to stand up for injustice and ‘A Mercy Response to our Neighbours’. On day 6 the Pilgrims ventured to the corners of Dublin and beyond to visit Mercy Ministry at work Ireland style. Day 7 was time to pause and reflect as we nourished our spirit, walking with Fr Michael Rogers and Fr Pat Murphy around the Monastic City of Glendalough, the Valley of Two Lakes. In one of the most spectacular spots in the country we celebrated Eucharist together along the Upper Lake and under magnificent blue skies inside the roofless Reefert Church, dating back to the 11th Century. Now it was time to turn thoughts toward home. Sr Maria McGuiness laid the platform to discuss how, through our values we live Mercy today, and how in our various roles do we work for a world where mercy and justice meet? For Sr Maria“Mercy is a door through which we glimpse the heart of God. When justice meets mercy, possibilities increase for things to be set right”. On the last day, joined by partners and spouses, Fr John O’Gara celebrated with us our Pilgrimage Mass. One might be excused for thinking it was all work. There was time for R&R. Amongst the heavy workload there were times for laughter, social activities and to experience and enjoy the many sights, sounds, tastes and smells of Dublin. On Friday, 18 May 2018, 33 Pilgrims who arrived at Catherines House at the beginning of the Pilgrimage almost as strangers left Catherines House as people on a journey, sharing the common purpose of how to better live out our roles as leaders in Mercy Ministry, reawakening the courage to look to the future with hope. And so the invitation is, are we prepared to go beyond the comforts of our school, our vehicle, our office, and reach out to those who seek comforts and are in today’s world, the poor? As Sr Mary Reynolds said at our final session, reflecting on the 9 days that had passed… Catherine would surely shout hurrah to it all.